The 32 metre motor yacht Cassiopeia has switched central agencies and is now listed for sale by Rytis Babravicius at Ocean Independence. Built in aluminium by Dutch yard Holland Jachtbouw to a design by Bill Langan and delivered in 2004 with a refit in 2014, Cassiopeia combines impressive performance and fast cruising speeds with tradition and elegance. A popular charter yacht, this yacht for sale is MCA compliant and her traditional teak interior is complemented by sophisticated entertainment and communications systems, not to mention a vast array of watersports equipment: the perfect combination of old and new. Her exquisitely decorated full-beam main saloon is flooded with light to create a sense of space, while a large separate dining area provides guests with a choice of entertaining areas. 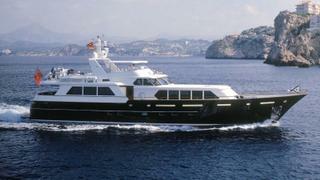 Immaculately maintained, this charming gentleman’s motor yacht is in excellent condition. Accommodation is for up to seven guests in a master suite, VIP suite and a twin cabin with Pullman berth, all with en suite bathrooms. Twin 1,800hp MTU diesel engines give her a cruising speed of 17 knots and she is fitted with Naiad zero speed stabilisers. Lying in Imperia, Italy, Cassiopeia is asking €4,750,000 with VAT paid.